There are a lot of great finishing touches available for your next bathroom or kitchen! Here’s a list of the Top 5 Hardware & Fixture Options in 2019 that our designers and clients love! 1. Metal Sinks: Metallic sinks can bring unexpected color and finish to your kitchen or bathroom remodel- your sink can also be beautiful, not just functional! 2. Open Plumbing: Industrial elements, such as exposed plumbing hardware, can add a pleasing contrast to the more ornate and elegant design materials in the room. 3. Concealing the Kitchen Hood/Vent: A popular new trend is to forgo the industrial look of an oven hood, and encase it with finished carpentry that matches the surrounding cabinets. 4. Mixed Metals: It’s 2019 and you’re no longer stuck selecting just one finish for your entire design. Mixed metals can add complexity and visual intrigue to your kitchen or bath. 5. Tech Features: Your hardware isn’t just drawer pulls and sconces, it’s also the built-in USB ports above your countertops, and digital features that add luxury and modern amenities to your home. Which is your favorite? Let us know in the comments below! And when you’re ready to renew, remodel or renovate your kitchen or bath, give The JAE Company a call or visit one of our Central Ohio showrooms! 1. 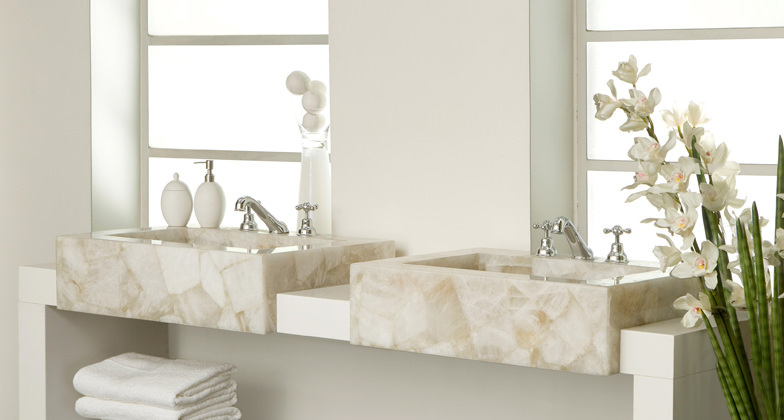 Floating Vanities: floating vanities give the space a modern look and can make a small bathroom appear more roomier. 2. Wall-mounted toilets: Similar to floating vanities, wall mounted toilets can save floor space and make cleaning the floor much easier. 3. Console sinks with exposed hardware/plumbing: Console sinks are becoming more popular, allowing for elegant, open and ornate industrial design- just make sure you’ve got your storage solution accounted for elsewhere in the bathroom. 4. Side-mounted faucets: Slim vanities with side-mounted faucets can create additional space in smaller bathrooms, or simply an unconventional design element for your remodel. 5. Marble Finishes: Marble can give your bathroom the elegance and beauty of nature, while providing a timeless look that can stand up to the heat and steam of your shower. Feeling inspired to renew, renovate or remodel your bathroom? Give the JAE Company a call today to set up an appointment with our talented staff! Or come visit us at one of our Central Ohio showrooms! Cherry Wood: Both common and traditional, designers are moving away from the once popular cherry wood when selecting cabinets and finishes. Subway Tile: Many new kitchen and bathrooms over the past decade have utilized subway tile, but over saturation has many designers seeing this classic tile as tired instead of timeless. Pot Racks: Many of our clients would rather store pots and pans in deep cabinetry to avoid having their cookware collect dust overhead. Furthermore, a de-cluttered and organized kitchen doesn’t benefit from your pan collection being mounted to the ceiling. Barn Doors: Similar to subway tile, barn doors have increased in popularity over the past few years. We appreciate the “upcycling” effort but not every space needs a big, bulky wooden door. Brown Granite: Clients and designers alike are moving away from brown granite and stone countertops, moving towards more cleaner-looking finishes. Think we missed one? Let us know in the comments below. And when you’re ready to renew, renovate or remodel your kitchen or bath, give the JAE Company a call today to set up an appointment with our talented staff! Or come visit us at one of our Central Ohio showrooms! 1. Dark Matte Appliances: Top manufacturers are all designing for what’s the next “stainless steel” in kitchen design. From the looks of it, dark and matte finishes are what’s next in 2019. 2. Column & Glass Door Refrigerators come in many shapes and sizes, and the latest column and glass front models that are getting our clients attention. 3. Induction Cooktops: Boiling water up to 50% faster than traditional gas or electric stove, induction cooktops use magentic current. And they’re not just fast: they also maintain a steady temperature more accurately and save on your utility bills. 4. Touch Controls: Touch-controlled stovetops, such as GE’s Glide Control system or the LG Series Radiant cooktops, offer precision temperature control and easy clean-up. 5. Old Is New: retro appliances are making a big splash in 2019 and can add a fun focal point to your kitchen! If you’re feeling inspired to renew, renovate or remodel your kitchen or bath, give the JAE Company a call today to set up an appointment with our talented staff! Or come visit us at one of our Central Ohio showrooms! 2019 is in full swing and if you’re ready to renew, renovate or remodel your kitchen or bath, here’s a list of the hottest new remodeling design trends for 2019!. Dark, Matte Finishes: From cabinets and wall color to even appliances, we are seeing more darker hues than in years past. In contrast to the classic all-white kitchen and bath, many designers and clients are looking for a more warm and intimate setting. Colorful Appliances: The color accent of your kitchen isn’t limited to the the backsplash tile, artwork or decorations. Many appliance manufacturers are starting to carry colorful appliances that add a fun focal point to your home’s design. Statement Sinks: Combining form and function, a “statement sink” is another way to add character and style to your home. Stone, metallics, patterns and even just brightly colored, there are many beautiful sink options to add style to your kitchen and bath. Digital Technology: As technology for the home continues to develop and improve every year, we are seeing more of it being integrated into the design of our clients homes. From smart fridges and wine stations, to touch controlled cooktops and color-changing lighting, plenty of options are available for you to have the modern home of your dreams. Less is More: Many of our clients take the opportunity to de-clutter during a home renovation or remodel. Working that sense of minimalism into your design can make small spaces look bigger and more calming. Some designers work minimalism into the form and function of the spaces as well with handle-less cabinets and hidden appliances. If you’re feeling inspired to renew, renovate or remodel your kitchen or bath, give the JAE Company call today to set up an appointment with our talented staff! Or come visit us at one of our Central Ohio showrooms! Select a darker painted or wood cabinet for below the countertops. Go with a bold color choice for your kitchen island cabinetry. Choose a feature wall or space to go with a different color, such as around a large appliance. Not only will these designs add visual interest to your new kitchen, it also can be a nice compromise between home owners who cannot agree on one type! When you’re ready for new cabinets, or an entire kitchen remodel, be sure to talk to the talented team at The JAE Company! We’re ready to make your next dream kitchen a reality, and we’ve got all the beautiful KitchenCraft cabinets you see in this blog post! Contact us today! Bathroom remodeling projects always include features such as the toilet, shower/tub, cabinetry, vanity sink, etc… but if you’re looking to make your next bathroom stand out from the crowd, here’s a list of the Top 5 Unexpected Bathroom Remodeling Features. Entertainment. We’re not talking about that waterproof radio that hangs in your shower! Modern bathroom remodels can now include built-in speaker systems, such as the combo showerhead/speaker from Kohler, to a built-in space for a television. Catch up on the weather or news as you get ready to start your day! 3D Tile. Subway tile is great, but if you’re looking for something new to really make your bathroom standout, consider three-dimensional tile around your vanity or lighting. It can add design, texture, and intrigue to a normally functional space. Fire. Ventless fire features are smaller and more affordable than ever. You can add warmth, luxury and even romance to your bathroom with a gas fireplace! Heated floors and towel warmers. OK, so a fireplace might be tough to include in a smaller budget, but that doesn’t mean you have to totally skimp out on warmth! Radiant floor heating systems are more common than ever, and for the smaller budgets, a heated towel rack can add a lot of value and comfort. Deluxe showers. From floor-to-ceiling glass, built-in benches and spa-like shower experiences, why settle on just a single shower head and a curtain? You work hard and you deserve the best shower experience every day. Feeling inspired to start your next bathroom remodel? The JAE Company has the right team in place to design your next bathroom, complete with all the expected and unexpected features you desire. Contact us today! There’s a lot consider when planning for a kitchen remodel. To help make the important decisions, here’s a list of the Top 5 features of any kitchen remodeling project! Appliances. Appliances will arguably be the most utilized feature of your kitchen remodel, so choosing the right ones for your home is critical- not just for the look and feel of your kitchen, but also for your budget! Make sure you look for energy-saving models, and those that are well-built, especially if you have a lot of kitchen traffic from friends and family. Counters. Countertop style and color typically drive the look of your kitchen remodel. Whether you choose granite or quartz, you’re going to want a material that lasts. Flexibility may also be important to you. A neutral countertop can coexist with a number of different colors- so in a couple years when your spouse decides that a “red” kitchen is no longer the answer, you can refresh your kitchen colors without paying for new countertops again. Cabinetry. Storage is a big concern in kitchens, and making sure your storage is beautiful is just as important! Your cabinetry must make sense for your remodel, both in form and function. Today’s cabinetry manufacturers offer more custom features than ever before, so it’s important to know what’s best for you and your family. For example: don’t have a Keurig coffee machine? Then you can probably pass on the custom K-Cup drawer. Tile & Backsplash. Choosing the right tile means not just flooring, but also the backsplash around your countertops. The backsplash area can range from inexpensive options like paint & wallpaper, to more expensive choices such as glass and porcelain tile. Like most aspects of a remodel, the more you spend, the higher quality of material you will get, and the longer it will last. Hardware. From larger hardware choices such as lighting and faucets, down to the smallest of cabinet handles, beautiful hardware can add the finishing touch that really makes a new kitchen shine. You’ll want hardware that is easy to clean, and tough enough to withstand the hands, heat, steam, and water of a busy kitchen. You’ll also want to make sure that the hardware you want is available in the finish you desire, whether that be brass, copper, stainless, or oiled bronze. There’s a lot to choose from! Get the best advice on these Top 5 kitchen remodeling features by calling The JAE Company! 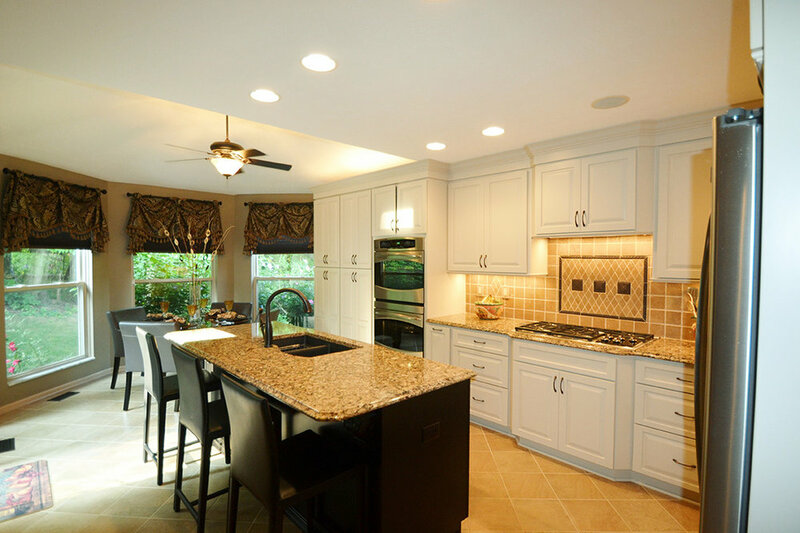 We have the staff and experience needed to make your kitchen remodel dreams a reality. Contact us today! Remodeling your bathroom is a large undertaking, filled with many potential pitfalls for homeowners. Let’s take a look at the Top 5 Costly Mistakes -and how to avoid them! Not Having A Plan - Especially Before Demo Day! Your bathroom, like your kitchen, is a room full of both style AND functionality. Thus, you must have a plan for your remodel before you tear the place apart. Water and electric are costly to move, so it’s an important decision if you’re thinking about relocating your toilet, shower/tub and lighting. Even your outlets are an important consideration. Before starting your remodel with a sledgehammer, make sure you have a solid plan of attack - your budget depends on it. Not Paying A Pro. You may think you’re saving money by hiring a cheap contractor, but you run the risk of wasting money on sub-par work. Ask your soon-to-be-hired contractor for references and images of past client work. Make sure they have proper licensing and insurance. Websites like Houzz and Angie’s List can assist with this decision as well. Remember, there’s no greater waste of money than having to complete a project twice. Putting Form Over Function. You want your new bathroom to look great, but you need to make appropriate decisions for the purpose of the space. These choices include finish materials, storage, and tiling. You want to make sure your materials can withstand the moisture and heat of a bathroom- while holding up to the needs of its everyday use. Ignoring Proper Ventilation. Without the right bathroom fan for the space, humidity can build up up on bathroom surfaces. Over time, this moisture cause paint and grout to deteriorate, and mildew to form. If you’ve got the added features of a steam shower or heated floors, make sure you’ve also invested in a proper exhaust fan. Ignoring Your Budget. It’s critical that you do your homework on what you can afford for your bathroom remodel. In addition, set aside reserve funds so that when unexpected costs pop up, they don’t shut down your project or create the stress of an unfinished bathroom. Be realistic so that you don't have to cut corners- then you and your family can be happy with the finished product! You can avoid these 5 costly mistakes by calling the JAE Company! We have the staff and experience needed to make your bathroom remodel a positive experience. Give us a call today! Should Your Bathroom Remodel Include A Tub? If So, What Kind? What do you have room for? This is largely decided by the size of your bathroom overall, unless you plan to expand the size of the room by moving or blowing out the walls. Adding a stand-alone tub can double the footprint of your previous shower/tub, and thus is an important decision not only for style, but also for your budget. What kind of tub best suits the style of your remodel? For the most part, there’s 3 major options here: stand-alone, alcove (embedded in 3 walls), or deck-mounted within a built-in structure. This decision should be made in conjunction with the rest of your bathroom design, as well as the space available. What will fit, and what suits the overall design? How big of a bathtub? Will a standard bathtub size meet your needs, or do you need a “soaker” tub model, or a bathtub that’s built for two? This is a simple issue of scale, as well as who will be using it. Will large adults be using the tub? If so, a soaker sized model is probably best. Resale Value: The beauty and design of a stand-alone soaker tub can attract buyers. But getting past considerations of luxury, many new home buyers are often looking for a house for their growing families- and bath tubs are key when raising young children. If at least one of your bathrooms already has a tub, then you may forgo the option of another tub in your master bath. But if the remodel is for the only bathroom in the entire house, the tub is probably an important addition- especially when you put your house back on the market. If you’re looking for help with your bathtub decision, or with any part of the remodeling process, the staff at The JAE Company are here to help! We’ve got the people and experience to help make your dream bathroom become a reality. Kitchen Islands are known for adding additional counter space and storage to your home. But often overlooked is how an island can give you new space for the convenience of appliances! Here’s a list of some great appliance options when designing your new kitchen island. Stove Top. We do most of our hosting in the kitchen, so why not put your stove in the middle of the action? Moving the stove may help with the flow of your kitchen and free up counter space under cabinetry around the outside of the room. Sink / Wet Bar. If you’ve got a busy kitchen, moving the sink to the kitchen island can give everyone access to it. The added counter space of the island may also give you the choice of a larger sink, if that’s important to you. 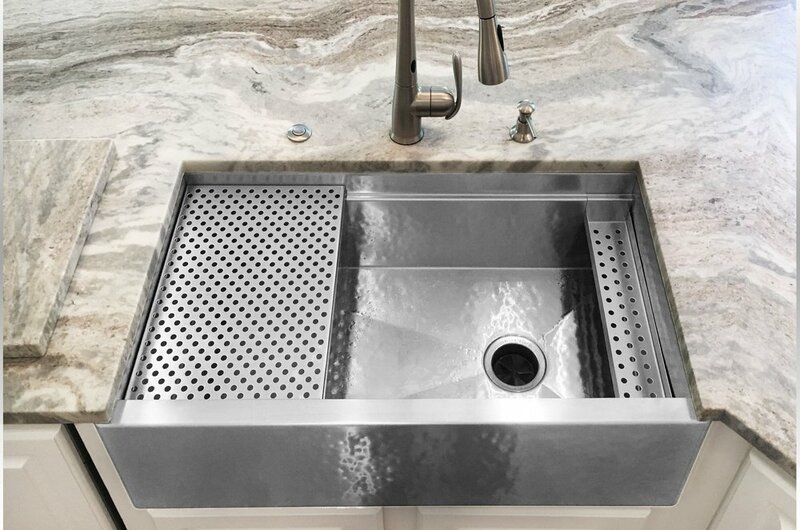 Another option is to add a “wet bar” sink for additional convenience when hosting. Dishwasher. If you currently lack under-the-counter space for a dishwasher, a new kitchen island may provide the room you were looking for. And if you’ve got an especially large family, even two dishwashers can be an option in your island. Wine cooler. You may not have room for that wine cellar you’ve always dreamed about, but adding a wine cooler to your kitchen island is a welcome addition for any wine aficionado. Small beverage refrigerators such as these can be great for hosting too. Trash compactor. Nothing can ruin the beauty of a kitchen faster than a trash can, especially if you’ve got a big family. A trash compactor gives you a tidy and discreet place for waste, while helping to minimize the amount of trash you have to take to the curb on trash day. If you don’t have space for these types of amenities in your current kitchen, a kitchen island might just be the answer you were looking for. Appliances in your kitchen island are not only convenient, but can increase the resale value of your home. Contact the JAE Company today to get started on your own kitchen island! We have the staff and expertise to help. Call today! Clearly, Quartz is King of 2018 . . . But Why? The kitchen is the heart and soul of your home. Naturally this is the room where the most spills and messes occur, so why would you settle for anything less than the best when it comes to your countertops? Quartz countertops do not have the need to be sealed or polished every year creating no fuss, stress free, easy way to clean your space. Although the initial costs of quartz may seem a bit overwhelming, not needing to maintain your countertops over time proves to be more cost effective, giving you a good return on your investment. Some other natural stones are more porous and are prone to staining and harboring harmful bacteria within its surfaces. Because quartz is a non porous surface you do not have to worry about bacteria from leftover food, raw cooking ingredients or spills soaking into your countertop. Whether you are searching for a durable and easy-to-clean countertop in your bath or your kitchen, choosing quartz is a hassle-free choice. Although quartz is not immune to damage it is more durable than marble and granite. Because it is engineered stone and is nonporous, it is less prone to chipping, cracking, staining, scratching and staining. Quartz comes in a wide range of colors, unlike granite and marble which is limited because of it being an all-natural material. During production color pigments are added creating many variations in color and styles giving you countless options to choose from. Organization Ideas For Your Kitchen! Many of our kitchens are lacking one of the most important aspects of them all . . . Organization. An unorganized kitchen can easily cause clutter, frustration looking for lost items, wasted time, wasted space, and unnecessary stress. We chose some of our favorite organization features from KraftMaid that you can add to your home to help turn your kitchen into the kitchen you LOVE to spend time in! The Pot and Pan Pull out shelving storage. How have we survived so long without this? It's that amazing! The pull-out shelf makes it easy to utilize every bit of space in your lower cabinets. This feature also gives you easy access to every inch of storage you have. You won't have to strain yourself searching for lost lids that have been shoved to the back anymore. When you have the pan, you need you just slide the shelve back into the cabinet and you're done! No fuss storage. This angled spice rack drawer insert is perfect solution to keep your spices organized and easy to find! The angled shelves make it easy to grab what you need quickly! There is a small section in the back that you can store measure cups, measuring spoons or other small items. We LOVE this idea of using a drawer for spices instead traditional shelved cabinet because it is easier to find what you need while you are cooking. This is a must have feature to your kitchen organization. The Pull-out Cabinet might be one of the most stylish ways of managing your waste and recycling bins ever. How wonderful would it be to store your waste and recycling bins out of sight but still easily accessible? No more hiding your waste can under the sink, or having to walk out to the garage to set your recycling aside. Keep your kitchen cleaner, less cluttered, stress free and beautiful! Last but not least we have the Double layered utensil drawer. This fun feature helps you keep everything organized and in one easy to find place! By storing larger serving utensils underneath and your everyday silverware above you can double your storage in addition to keeping your counters clean and cluttered free! Now you don't need to use two drawers for your utensils! Would any of these fun organization features be a feature in the kitchen you Love? Let us know at facebook.com/thejaecompany. It was 1951 when Joseph and Paul Jacobs decided to carry their family name and reputation, and form The JAE Company. They were later joined by their brother Ray and ran the company together. A lot has changed since the days the company was located at 433 S. Third Street, but the attention to detail and personalized service has been the focus generation after generation. No other business in this area comes close to the commitment and level of customer service that The JAE Company offers to their clients. During WWII, there were a lot of industries making war material out of steel but when the war ended, Americans needed to figure out how to put people back to work and what to do with those industries. At that time, the housing industry revolved around the construction of spec homes which included steel cabinets. The Jacobs brothers realized this as a trend and decided to base their business around wholesale stock cabinets. In 1978 – 1979 when the economy declined and home interest rates went up to 20 percent, builders stopped building spec homes and started focusing in the construction of custom homes. Due to this change in the market, The Jacob brothers reinvented the JAE Company to focus on custom cabinetry, appliances and kitchen design. Customers responded well to the new business model as The JAE Company already had a great reputation in the cabinetry industry. The Jacobs family line is still involved in running The JAE Company. Mark Humrichouser, who married to Joseph’s daughter, currently runs the day-to-day business operations and his son Todd is in charge of the company’s labor department. Over the years, the kitchen and bath business has changed but The JAE Company continues to thrive generation after generation. People who have previously partnered with the JAE Company for a kitchen or bath project, will quite often return years later with their children or grandchildren as new customers. “We believe in doing right by our customers. We want to help you love your kitchen or bath. We offer a complimentary design service where we will help you design your dream kitchen or bath, show you our products, and offer great customer service throughout the process,” Mark said. “Our business doesn’t survive only from reputation; word-of-mouth and generational clients help us thrive,” Todd said. To learn how The JAE Company can help you love your kitchen and bath, please contact us today. The JAE Company has a rich history of working with the finest products and designers, and that’s why we partner with companies like KraftMaid. We know you trust us to build your dream kitchen or bath incorporating the highest-quality products and finishes, and we don’t believe you will find a better cabinet option. Cabinetry is a central aspect of any kitchen or bath remodeling project, and deciding on the look of cabinets can be one of the most important choices you’ll make throughout the remodeling process. New cabinets provide homeowners with a chance to update the look of their space while also building a custom storage system that works for their particular needs. Cabinets make up the base of any kitchen and can set the design tone for the entire room. Homeowners armed with inspiration images from Pinterest will love working with KraftMaid to design their dream cabinetry. Choose from over 65 finish options, 100 door styles and over 200 storage solutions to design a truly customized cabinet system that works for your family—and makes a serious style statement. KraftMaid combines the flexibility and customization you’d find in a local, shop-built option but with the latest finishes and accessories and state-of-the-art manufacturing process our homeowners deserve. We appreciate the KraftMaid difference and are proud to incorporate their customized, built-to-order products into our kitchen and bath remodel designs. KraftMaid takes a One Kitchen at a Time approach to building cabinets. In order to ensure consistency when making the cabinets for one full kitchen project, and to minimize the amount of handling for each product, KraftMaid requires that all cabinets for a complete order are built on the same line where they are assembled, packaged and loaded for shipping. And every KraftMaid cabinet is still made by two human hands. 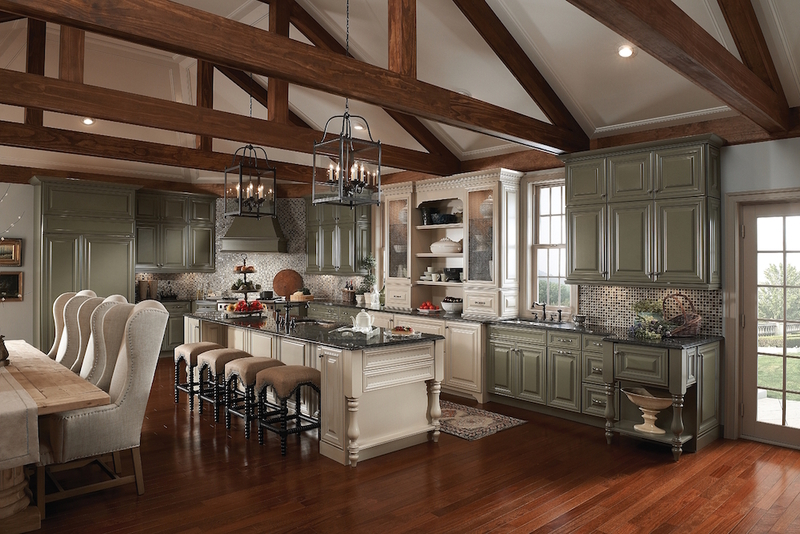 This is a company that reveres the time-honored tradition of cabinetry and it shows in their manufacturing process. KraftMaid’s wood doors and drawer fronts are all finished using the company’s DuraKraft furniture finishing process, which means homeowners enjoy the finest finishes available in the industry. Your doors and drawers are machine and hand sanded, then vacuumed in preparation for staining. KraftMaid applies special stains to create a consistent color and balance the base color of the wood. Next, your cabinets are hand-rubbed with a deep penetrating stain to reveal the hidden beauty of the grain. From there, your cabinetry is air-dried before receiving a specialty finish such as distressing or glazing. A specially formulated wood sealer is applied, then the doors and drawers are oven-cured. Your custom cabinetry is finished off with a DuraKraft topcoat, an oven-baked finish that can stand up to everyday wear and tear while at the same time also accentuating the original color and clarity of the wood. Refreshingly, this hands-on approach actually comes with one of the shortest turnaround times in the industry. Typically, your built-to-order cabinets will be delivered about four weeks from the day you order. And we know a quick turnaround is essential in a home remodeling project with many moving pieces and parts. Visit The JAE Company kitchen and bath Design Centers in Westerville or Upper Arlington to start planning your project today. KraftMaid takes the counter space back from your mixer. We all LOVE our Kitchen mixers, but we don't love how difficult they can be to get out and use. They are a huge asset to the kitchen for so many different reasons, but unfortunately they can also be a huge pain to move around. They are bulky and extremely heavy to lift up onto the counter or table. Who said your kitchen island has to stay in one place? A floating island gives you added prep space or an entertainment area where you need it most. Simply roll it where you need it or tuck it out of the way. KraftMaid shows us how to make a message center for the Kids! If you LOVE your kitchen like we do, you no doubt have a space to store all of your messages, grocery lists and reminders. A simple cork board or chalk board usually does the trick, but the usual spots are hard for kids to reach. Another clever solution from KraftMaid. Your Sink Can't Stop This Drawer! Bathroom and Kitchen Innovation from Kraftmaid: Sink Based Drawers! These drawers give you under-sink storage without the hassle of crawling on your hands and knees to find what's hidden in the back, bringing everything forward for quick access. The kitchen is the epicenter of your home and the cabinets and countertops you choose are an expression of your taste. The JAE Company’s team of experts will guide you through our exceptional array of styles and wood species to ensure that your kitchen project meets your every expectation.